Oh, thank God. Cymbals Eat Guitars, with their celebrated ’90s alt-rock leanings (think Built To Spill, Pavement, Sonic Youth… yeah, they’re that good) is back again with a sophomore LP titled Lenses Alien. Are you stoked? Because I am. Following Why There Are Mountains after so much initial (and warranted) buzz must not have been easy. Sure, the lineup has switched up a bit (Brian Hamilton is now on keys and Matthew Whipple is on bass), but it has only solidified their sound into something a little more cohesive. Producer John Agnello, who has worked with Dinosaur Jr., Nada Surf, The Hold Steady, and a slew of other notables collaborated on CEG’s latest output. They’ve kept the distorted guitars, crashing cymbals, and psych-rock blurred moments. 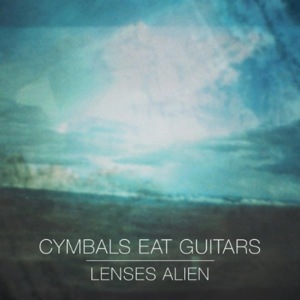 Whereas on Why There Are Moments the songs leaned on the long side (7-8 minutes is hard to be radio friendly), Lenses Alien starts off with only one extraneous song, “Rifle Eyesight (Proper Name)” and then transitions into catchier 2-3 minute songs of upbeat vocals and atmospheric (that doesn’t always just mean “noisy”) instrumentals. With a second LP came signing onto a record label, and now Barsuk Records houses CEG. As one of the labels I drool over, they also host artists such as Death Cab For Cutie, David Bazan, and The Dismemberment Plan. With a steady footing in the psych-prog-alt world, Cymbals Eat Guitars’ future seems to be anything but distorted.